Plans that would see a fire damaged pub in Warwick turned into homes have been recommended for approval. The controversial plans would see the former Great Western pub in Coventry road demolished and four houses put on the site. The Great Western Pub, which was damaged by a fire in August 2017. This is the fourth time that the developer P&P Properties have put plans forward for the site with the current plans being a resubmission of an application submitted in May 2018, which was withdrawn in August 2018. When the previous plans were submitted and again when the current plans were submitted many residents objected to the plans stating that the building should be protected and that the original building should be rejuvinated instead of demolished. However, in Warwick District Council's planning agenda for the application it says: "Following a fire at the site which means that the Great Western cannot now be converted, the current permission seeks to construct four town houses at the front of the site." It also states that since the application was submitted the design of the proposed houses have been altered to "better reflect the existing design of the Great Western, to include hipped roof, brick quoin features, arched window heads and a design which betters respects the corner plot." "The use of render across the rear elevation has been removed from the amended drawings as facing brickwork is considered to be a more traditional finish, which is in keeping with the character of the existing property." The houses have also been changed from four bedrooms to three bedrooms. This current application has has more than 70 letters of objection including from Warwick Town Council. The developer previously submitted two planning applications in 2016. The first, in March 2016, was for a change of use to residential accommodation and to convert the building into flats and build four houses. This application was refused by Warwick District Council’s planning committee because the design of the houses and there was no outdoor amenity space. The second plan was submitted in June 2016, again for change of use to create flats and build four houses. This plan was granted permission. Because of securing permission in 2016, four houses are already set to go along Station Road and the newly submitted plans, would have seen an additional four houses on the Coventry Road side, where the pub now stands. The plans have been recommended for approval by planning officers and the application will be heard at Warwick District Council's planning meeting on Wednesday (January 30). 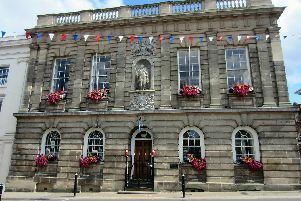 To view plans for the Great Western Pub go to Warwick District Council’s planning portal and search: W/18/1960.